Dr. Marthad Ayoub obtained Bachelor of Medicine and Surgery (MBBS) from National Ribat University, Sudan in 2010. He has over 6 years experience in medical field. 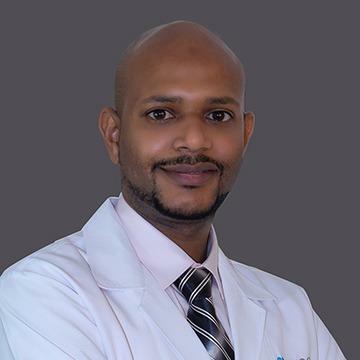 He started his professional journey in Sudan as Medical Officer in ER and Surgery at Ahmed Qasim Hospital, Sudan. Then he joined Haj Alsafi Hospital, Sudan in Surgery and ER for 8 months and Ibraheim Malik Hospital, Sudan for 10 months. He joined Madinat Al Ain Medical Center in Sharjah, UAE as General Practitioner for 2 years and 2 months before joining NMC. His most experience in chronic condition like diabetes, hypertension, hyperlipidemia, respiratory and gastric diseases etc. He is certified in Advanced Cardiac Life Support. Dr. Marthad is fluent in Arabic and English.